For top rated roofers in Goodyear who know just how important the state of your roof is to you, contact the professional roofing contractors at Arizona Roof Rescue. Providing a variety of roofing services including tile roof repair and replacement, as well as shingle roof installations and repair, Arizona Roof Rescue serves Goodyear and surrounding cities to bring quality roofing and trusted workmanship to residential and commercial properties. With five star reviews on Google, Yelp, Home Advisor, and Angie’s List, our roofing contractors will give you peace of mind when you need your roof repaired or replaced. 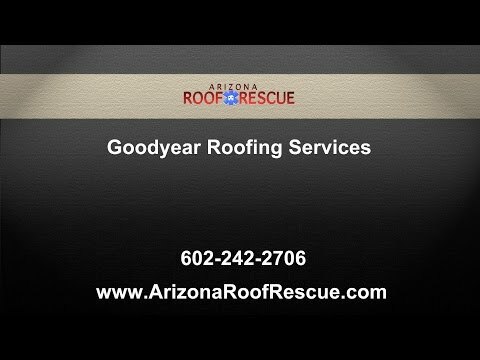 Arizona Roof Rescue is here to help those in need of Goodyear roofing assistance during the unsteady months of the summer. Although fairly agreeable from the fall to spring months, the weather in this area of the country is very unreliable during the monsoon season in the summer months. This causes all sorts of problems with the roof boards, insulation, and pest control. Even worse, most roof companies focus mainly in central Phoenix as well as the east valley, but do not pay much attention to the west valley. This is not only beneficial to neighborhoods, but to businesses as well due to our professional commercial roofing services. Our licensed Arizona roofing contractors specialize in sloped and flat roof sealing and trained in all different sorts of rooftops and roof-related issues. For roofers in Goodyear who are dedicated to providing the highest quality tile roof replacement and shingle roof repairs, trust the experts at Arizona Roof Rescue. We can make sure that your roof is repaired or replaced with excellent quality workmanship and only the best materials. When the roof of your home becomes compromised due to old age and common wear and tear, Arizona Roof Rescue can provide new roof installations for your home or business in Goodyear, ensuring quality and peace of mind for your new roof and making sure it lasts for years to come. When monsoon season strikes in Goodyear, you need top rated roofers who are qualified and capable of repairing your roof with ease. Arizona Roof Rescue is a trustworthy roofing company in Goodyear who can repair your tile roof or shingle roof with professionalism and efficiency. We can provide affordable and quality service to those in need in Goodyear! Value and quality are our primary concerns, as we are familiar with dealing with insurance companies. Check us out and see what we can offer, you won’t be disappointed! For a roofing company in the Goodyear areas of 85236, 85338, 85340, and 85395 who are qualified to bring you the highest quality tile and shingle re-roofing, roof repair, or new roof installations, trust the roofing contractors at Arizona Roof Rescue. A+ rated with the Better Business Bureau, you will find no better roofing company to work on your roof than Arizona Roof Rescue. Licensed, bonded, and insured, we have over 20 years of roofing experience in the Valley. For more information about our extensive roofing services for both commercial and residential properties, contact Arizona Roof Rescue today. Headquartered On The Goodyear Glendale Boarder!